There’s something about other cuisines that's fascinating. Food origins, cultures and traditions are what makes up the visible parts of a dish. You look at a plate, you see the ingredients, the colours, the produce. You take a spoonful to taste and you’re transported somewhere else. Beyond the boundaries of traditions and cultures are stories embedded in each. Rich and colourful. Stories of hardships and triumphs. Of families and separation. Each with a unique history. Its an endless wonder. Its fascinating. Sydney is such a fabulous place to be as the food scene is as multicultural as the population (biased here obviously, but let's not go there). 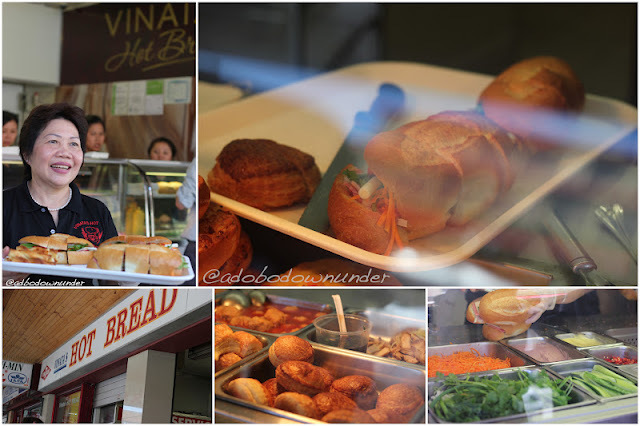 Practically every cuisine in the world can be found in some corner within the Sydney metropolitan. And one of the most famous is the little Saigon of Sydney - Cabramatta. And with this draws one to partake of authentic Vietnamese dishes. bahn xeo - Vietnamese pancake. another crowd pleaser! And it was fate that found me in Cabramatta one fine Saturday with all these amazing bloggers: : Rafael, Veronica, Oni, Melinda, Daniel and Adam. And together with special guest Simon Marnie and partner Amanda, we crawled the streets of Cabramatta and ate and drank to our hearts (and our stomachs) delights! Not only was this a degustation affair, Thang led us into the city centre streets, shopping centre and markets with stories of its rich history and food culture. Including where to best get good priced produce, meat and seafood, which bakeshop is open 24hours, where Luke Nguyen's family cafe used to be, and so much more! It was a feast for all the senses! Vinata's fresh pastries and that bahn mi (pork roll) - is the standard which future pork rolls shall be based! Love it! We had the classic pho from Phuo Viet, samples of some Vietnamese pastries including my new favourite pork roll Bahn mi kep thit from Vinata's Hot Bread, sugar cane juice with some cumquat extracts, a special feast at Bau Truong of : ca xuc banh trang (the fish curry is to die for! Seriously! You can ask everyone on the table! ), bahn xeo (Vietnamese pancakes), gol cuon (fresh rolls) and the most refreshing lemon-lime-lemongrass crush! We sampled famous Vietnamese sweets and drinks: pandan waffles, emperor's puffs, tau hu ngot (which is sweet silk tofu with sugar syrup), che xoi nuoc (which is a sweet sticky rice ball filled with mung beans), che dau (a glutinous rice dessert) and of course Vietnamese iced coffee. sugar cane juice. nom. nom. Fish curry with black sesame fried rice paper! Unpretentious and authentic, home made Vietnamese dish! In the six years that we’ve lived in Sydney, this was my second time in Cabramatta. And I’m crazy, I know that now. 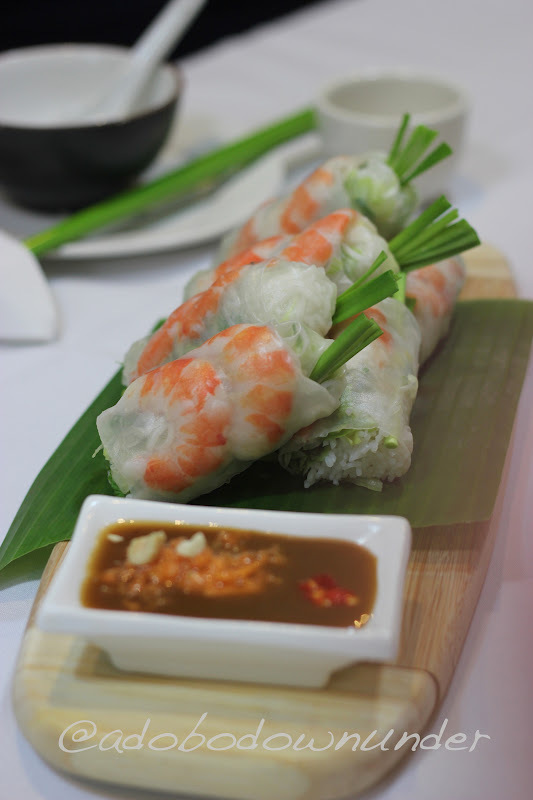 A short drive away is authentic Vietnamese dishes, fresh Asian produce, fruits , meat and seafood! I've eyed some potted herbs and plants too! So definitely coming back as a local next time. All that and we even got to take home a show bag! Thank you Thang for a truly unforgettable food crawl and special thanks to the sponsors Fairfield City Council (represented by the lovely Cheryl and husband David), Royal Umbrella Rice, SBS Feast Magazine and Lenovo. What a great wrap up of the day. To be honest, because I put the itinerary together, I've kinda lost perspective. Seeing it all again through your fresh eyes is such a wonderful experience for me, too! I was on a four a day habit at uni when I caught the train from Cabramatta in the morning. But, now that I live in the city my trips to cabramatta are fewer and fewer and generally tend to be for trips to Iron Chef and to have Yum Cha. You've made me feel like another trip out there though. Aw thanks Jasmin! Those pork rolls are absolutely the best! You said it Oni! And that pork roll! And that fish curry.... nom nom! Happy to put a face to all the tweets and instagram photos too! Twas a fab day!